Tongue – Ticklingly combination of sour, hot, pungent and spicy tastes, this Indian street food seasoning is a must have spice blend in any Indian kitchen. It may not be love at first smell with this unearthly spice. I say this because when you first open the pack or take a sniff it actually smells of rotten eggs and very sulphuric. Not really something that you would like to put in your mouth after the first encounter. But let me assure you that the overpowering smell camouflages its exotic etherial taste. My husband claims to hate the pungent taste and smell of chaat masala but devours any dish it is added to without even him realising that its the same dreaded spice blend that he so claims to dislike. I choose to keep my mouth shut on this and silently continue with my servings. An interesting fact about this unusual spice blend is that its one of those rare blends that Indians are absolutely happy with buying pre-mixed and off the shelf. It maybe because replicating the combination and balance of flavour and taste of Chaat Masala can be a bit tricky to achieve at home. But of course, that does not stop anyone from making Chaat Masala at home. If you have cooked Indian food or even eaten it, you may be aware of the frequently used word ‘Masala’, which literally translated to English means ‘spice’. You know when I mention Chana Masala or Meat Masala its something to do with chickpea spices or a seasoning for meat. But what is Chaat? Is it an ingredient, a dish, or a cooking method? Let’s say its a combination of all. In practice and in the Indian culinary world ‘Chaat’ is referred to a savoury sour dish. Usually a snack item and very popular street food. Akin to nachos and dips. Authentic Indian Chaat dishes are made without any cooking involved. The ingredients used may be pre-cooked like the puris (puffed pastry shells) or papri /( deep-fried pastry), boiled potatoes but the actual method of making a chaat does not involve the use of heat. It’s like making a tangy-sweet, spicy salad where different ingredients like puffed rice, potatoes, crispy fried pastry, freshly chopped onions and coriander leaves are all put together and mixed with different dressings called chutneys. ‘Chaat’ also refers to a particular taste too. Surprisingly ‘Chaat’ does not fall under any specific taste category. Rather it is a combination of different tastes such as hot, sweet, pungent, umami with an overriding sour taste. So broadly speaking it may be classified under sour but there are different flavour hints that you get in a chaat masala. For me it’s very difficult to truly explain the meaning of chaat by typing some descriptive words. You really need to experience the taste to understand what I am trying to say. Chaat Masala is a spice blend and is usually made with regular everyday spices like cumin seeds, coriander seeds, chilli powder combined with other pungent spices such as asafoetida, black salt, dry mango powder depending on the recipe. Because of the primary use of souring spices such as amchoor powder and black salt it broadly falls under the sour taste category. However, there are many different layers of taste to this versatile spice blend. Chaat Masala has a very strong and robust flavour which gives a different zing to any dish it is added to. Although a spice blend, Chaat Masala is, in culinary practice, a seasoning. It can be sprinkled on top or added directly to a dish without the need to cook, unlike most Indian spices. Indians don’t just use chaat masala for making chaat dishes. It’s a ‘pickup and sprinkle’ flavour enhancing seasoning for practically anything savoury or fruity. It is an add-on ingredient for making many different Indian street foods such as chaat dishes like alu tikki, papri chaat, puff rice chaat, samosas, chutneys etc. Chaat masala is also added to lentils, legumes or vegetarian curries. It is sprinkled as a seasoning on stir fried or deep fried dishes such as pakoras or patties. This universal spice can even be added to your fruit salad, normal salad, eggs, cheese, sauces. You can also add it to drinks especially buttermilk or lemonade for an uplifting tangy spicy taste. I seriously would encourage you to buy a packet of chaat masala and try using it in your cheese and cucumber sandwich or substitute salt with this spice in your salad. If you are disappointed with my suggestion then you know where to reach me and share your views. It took me a while to understand why few people get confused between Chaat Masala & Garam Masala powder. Both are not only different to taste but also have different uses. Although both are spice blends they are made with completely different spices. An interesting difference between spices and Chaat Masala is that while most spices need to be cooked to release its flavour this is not the case for using chaat masala. Since its a seasoning it can be added directly to the dish mostly at the end of cooking or before serving. While Garam Masala is a traditional Indian spice blend made with a combination of many different hot and sweet spices such as cloves, cinnamon, black peppercorns, cumin, coriander and many others; no sour spice is used in any Garam Masala at all. The spice combination is very different than the spices used in Chaat Masala. The primary spice in Chaat masala is amchoor powder (dry mango powder) or even dry pomegranate powder that gives it a very distinctive sour taste. There is also a marked difference in its use in cooking. Garam Masala needs to be cooked or added to hot curries and mixed well before serving, while Chaat Masala can simply be sprinkled right at the end. In summary, Garam Masala is a cooking spice while Chaat Masala is a seasoning. Aids in Digestion -The powerful antioxidants contained in mango powder, ginger powder and coriander powder help to combat constipation, flatulence and acidity. Detoxifying Properties – The powerful blend of different spices has vitamins A,C,D ,B6 and Iron in abundance. All are beneficial to remove toxins from the body, treating anaemia and curing the nervous system disorders. Regulate High Blood Pressure – Coriander seeds in chaat masala is known to lower high blood pressure and prevent heart attack and strokes. Helps improve metabolism- Mango powder is low in carbohydrate while the antioxidant present in amchur boost metabolism. The effect of both these properties helps to increase weight loss. As mentioned, Chaat Masala is a very common and extensively used Indian spice. However, it may not be readily available in the normal supermarket unless it has a dedicated Indian section. You can buy this spice from any Indian grocery store. Wherever you choose to buy it from make sure it is from a trusted source. Most Chaat Masalas are light beige to darker shades of beige in colour with a powdery texture. Ensure that the powder is smooth and not lumpy. Check the manufactured date as old packaged blends tend to have less aroma. 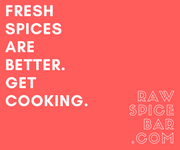 If you are based in the US you can buy freshly ground Chaat Masala from Raw Spice Bar online store delivered free to your doorstep. 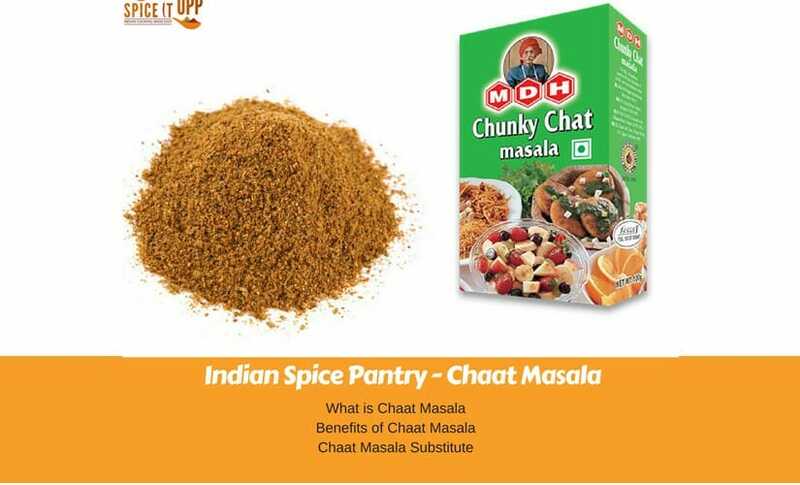 You can buy chaat masala like this very popular Indian brand from Amazon for worldwide delivery. Another online shopping store for your convenience of shopping a range of spices, seasoning and organic foods is Buy Wholefoods Online. Like most spices, Chaat masala tends to lose its freshness if not stored properly. Keep it in a tightly sealed glass container, or if it’s in a packet then close the opening of the packet tightly with a clip such as this one here. Store the powder in a dark, dry place away from direct sunlight. Well stored amchur powder will keep its character and flavour for almost a year. Since Chaat Masala is classified as a seasoning and has a strong flavour, it should not be used extensively. Use it sparingly if you need to add a tang to your recipe or even drink. It is very difficult to replicate the taste of chaat masala as it has a very distinctive use and flavour. Since the overriding taste is sour the best possible match is amchur powder, lemon juice or black salt. You can also add a mix of the following spices as a substitute for chaat masala. These are cumin powder, amchur powder, chilli powder and salt. Have you heard about or used Chaat Masala? I love to hear about your kitchen adventures so please share any recipes or tips. THANK YOU for this post! I have often seen this in supermarkets and wanted to know how to use it properly as I love spices. I appreciate all the detail you have given. I am so glad that you found this post useful. Let me know if you need any info or help to use it. Will be glad to assist. What a great resource! I love Indian food, and I’ve been trying my hand at cooking it, but the spices can be challenging to figure out when you didn’t grow up with them. I have a friend who is teaching me, but she doesn’t always know the reasons why a spice is used! I’m now curious to try some Chaat Masala to find out if I’ve had it before – I suspect not because I’m not really familiar with the sour flavour. If you have eaten onion bhajias or chana masala (chick pea curry) then chances are that it may have been added. It really depends on the person cooking it, as chaat masala is actually a seasoning to lift flavours rather than a spice. But do try it in case you find it. You can always check back with me and I will help you with its use. I am not real familiar with Indian food, so I have not heard of Chaat Masala before. From your description it sounds very good. I am always interested in new ways to add flavor to food, thanks so much for sharing this in depth description, look forward to reading more of your blog. Thanks Kristina! In case you do get your hands on one then try this spice. Its different but nice!